A few years ago, I facilitated a high school biology class for our local homeschool co-op and was reminded of the astronomical number of microorganisms present in a single sampling of pond water. Curious, I wondered if the same was true of salt water samples, and I discovered one source indicating that in a single drop (one milliliter) of seawater, one could find 10 million (!!!) viruses, one million (!!) bacteria and about 1,000 small protozoans and algae. If those findings are even half true, you can understand why looking into vast stretches of ocean waves quite simply blows.my.mind. On this pilgrimage to far-off lands, I raise my head from the majesty of the microscopic to face the exquisiteness of the expanses. Enter New Zealand, which wowed me again and again and again. From Matamata’s Alexander Farm (home of the Hobbiton movie set) to the geothermic activity of Rotorua including the Ohinemutu Maori Village, the natural beauty here surpassed even our most elaborate imaginings—and this was just on the North Island. 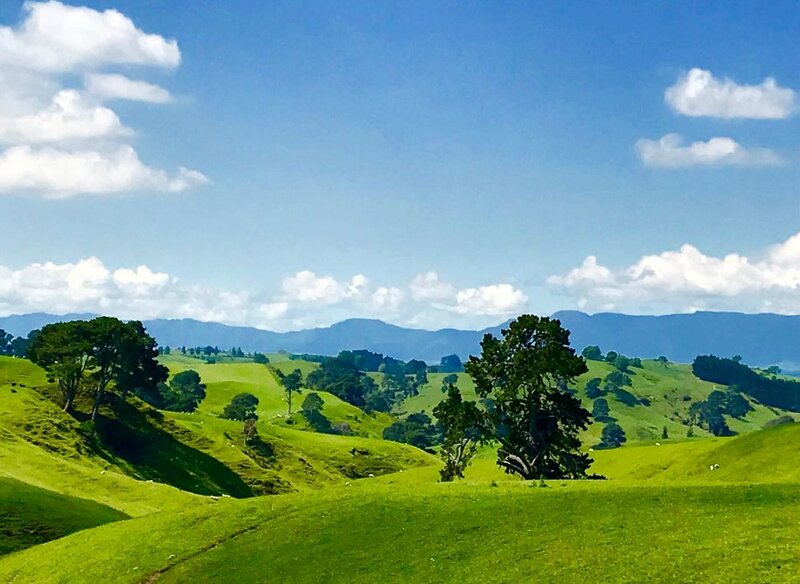 The sweeping pastoral pastures of Alexander Farm in Matamata, NZ filled our souls with serenity and calm unlike anything we've ever seen. We peek out of a hobbit hole at Hobbiton, the movie set of both The Hobbit and The Lord of the Rings which is preserved at Alexander Farm in Matamata. We thought this would be cheesy, but it was well worth the time and money! And WHOA was she right. From the rolling waves at Carter’s Beach to the pancake rocks at the Punakaiki Blow Holes; the milky snowmelt from Franz Josef Glacier to the panoramic views atop Queenstown Hill; the spectacularly sheer cliffs of the Milford Sound to the pastoral serenity of a sheep farm at Toko Mouth; a sighting of the rare, critically endangered yellow-eyed penguin to hundreds of ornery seals barking at Shag Point—our eyes drank in New Zealand’s natural beauty, and we left dumbfounded by her splendor, praising God for His astonishing creativity, and feeling facedown in humility by His unmatched capabilities. We stopped at Punakaiki Pancake Rocks & Blow Holes on a whim to stretch our legs during a long drive. We ended up hiking through this natural wonder for over an hour. We hiked about 45 minutes in to this viewing spot of Franz Josef Glacier. It's so big, it looks close to us here, but in reality, it's easily several miles away! So many times on this journey, Mitch and I lock glances, drop our mouths open, spread our arms wide toward the impressiveness all around, and utter… nothing. Because all adjectives sorely lack any capacity of describing what our eyes absorb. Rendered speechless, we simply stand in humble awe at God’s handiwork. Autumn *may* have selected a walking stick that was a *tad* too big for this trek up the Queenstown Hill. 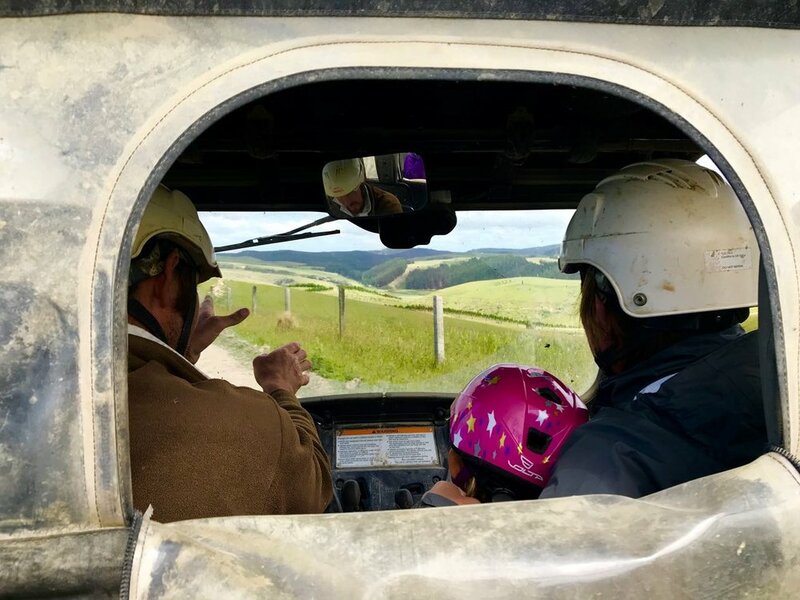 Simon Davies, sheep farmer at Coombe Hay Farm where we stayed in Toko Mouth, NZ, drives us around his magnificent property that overlooks the Southern Ocean. 'Tis the season for colonies of seals to come to shore to rest during the day. This seal hiked (for real!) up a cliff near the Katiki Lighthouse trails to get to this soft, grassy overlook, and he smiled for a photo with Mitch even though we woke him from a nap. Ever mindful of the beautiful skies (thanks to our late niece Maya's fascination with all things rainbows and sunsets), we felt especially blessed to see this colorful display near our place in Shag Point, New Zealand. It was the perfect backdrop to all those seals over there on that rock to the right. It seems appropriate, then, that although we take photo after photo, not one of our images captures fully the magnificence of what we’ve seen; it is befitting, too, that our words fail to describe the grandeur of all that His hands have made. Because try as we might, there is no apprehending fully the bigness of the glory of God. But intercepting even a fraction of His power and nature brings me to my knees. And I understand a little more why Moses removed his sandals at the base of the bush or why his face gleamed after time on the mountain. On this journey, armed with my camera and my words, I may feel as if I am apprehending a tiny fraction of God, but in reality, it is God who has been constantly in the process of gently apprehending me. This. THIS is my response to the God of the universe when His eternal power and divine nature so generously envelopes me when I am privileged to engage with His creation.